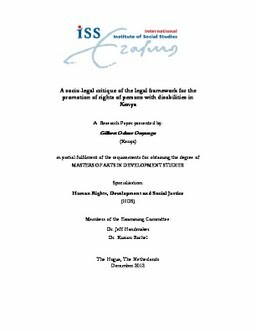 This research is a critical analysis of the legal framework on the rights of per-sons with disabilities in Kenya. It looks at the legal framework which in-cludes the United Nations Convention on the Rights of Persons with Disabilities (UNCRPD), the Constitution of Kenya, 2010 and the Persons with Disabilities Act, 2003 (PDA) with a view to establishing their shortcomings and why despite their provisions, the rights of persons with disabilities (PWDs) in Kenya continue to be violated. It therefore looks at and discusses the efficacy of the legal framework; the potential of the work done thus far; the potential of the relatively new concept known as “diffability” which recognises that PWDs have different abilities and should therefore be empowered to claim their rights based on these abilities. The research delves into the right of PWDs to participate in positions of lead-ership in a bid to bring out the fact that those in power continue to violate the rights of PWDs. The research uses a human rights based approach; the social and medical models of disability; and socio-legal approaches to argue that the legal framework in Kenya has serious shortcomings. It goes ahead to make recommendations on possible ways of improving the legal framework.